Nothing says, “I’m a 21st century loser,’’ like admitting you’ve fallen in love with an Android. I could dismiss my tryst with Motorola’s Droid - the lovely new Google Android phone from Verizon Wireless - as a rebound relationship, since my iPod Touch went missing three weeks ago. But the Droid, feature-for-feature, and with its connection to the growing Android market for cheap apps, is more than a match for the iPhone or iPod Touch. I also expect that the Droid will hold up nicely against the other Android devices we will be seeing in the coming months. When it comes to hardware, the Droid is a heavy hitter: It’s got an excellent, 3.7-inch haptic touchscreen, 5-megapixel camera with LED flash, and a “full’’ slider keypad. The pad, however, is Sinclair-like in its puniness and its use of multifunction keys. 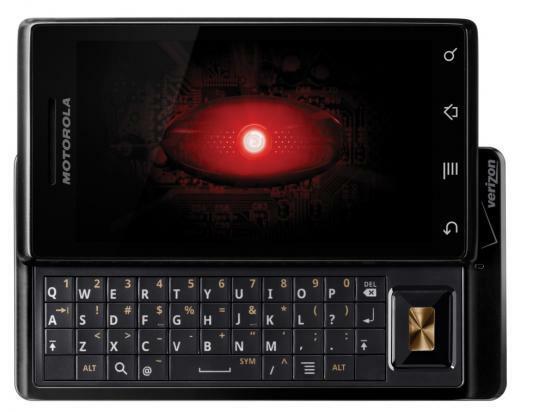 Motorola includes a directional “d-pad,’’ to the right of the keys. The Droid weighs about six ounces, making it too heavy for your shirt pocket but tolerable as an addition to your backpack. The most exciting bit about the Droid is that it serves as a portal to all of those wonderful, open source Android apps out there, such as the augmented reality exploration tool, Wikitude (wikitude.org). Wikitude’s developer recently created an iPhone version of the app. I spent much of one evening last week with the Droid and a sky map application that uses the phone’s GPS transponder, compass, and tilt sensor to show me exactly where to look for the center of the galaxy - even if I couldn’t see it through the clouds and light pollution that typically envelop the Boston area. Many Android apps, such as those for Flickr and YouTube, lack the polish of those made for the iPhone. But Google’s own apps, such as the super-addictive Sky Map, work excellently on the 3G-and-wi-fi capable Droid. Verizon Wireless has priced the Droid (phones.verizonwireless.com/motorola/droid/) at about $200, after rebate and with a two-year contract. Michael Epstein may be the first mogul in a new film industry, one that will eventually embrace both iPhone and Google Android apps, as well as augmented reality eyewear. Rather than full-length features that unfold over two hours inside a traditional theater, Epstein’s Boston-based company, Untravel Media Inc. (www.untravelmedia.com) makes apps that are part film and part walking tour, using your phone’s GPS coordinates to determine which clip to roll next. Untravel’s latest iPhone app is “Walking Cinema: Murder on Beacon Hill,’’ an adaptation of a PBS film about Boston’s notorious Parkman murder case (parkmanmurder.com). In “Walking Cinema,’’ you follow a milelong path on Beacon Hill, dotted with ink stamps and other artifacts, leading you to the home of the Brahmin who in 1849 found himself at the wrong end of a Harvard professor’s blade. “Murder on Beacon Hill,’’ which was produced in part with the participation of Massachusetts General Hospital and the Appalachian Mountain Club, includes eight stops at local businesses and historic sites. The tour starts at Mass General and heads down Charles Street and Mt. Vernon Street to Parkman’s house, on Walnut.